For five years now, Red Hat and Intel have hosted a small, but very cool security conference called “Defense in Depth (DiD)” in Tyson’s Corner, VA. Its popularity has been increasing, and this year is a sort of watershed event in the show’s history. DiD has, in the past, been very focused on the security of Red Hat’s products; this year we’re casting a wider net around the security of many open source communities. We even have an infosec A-lister keynoting — none other than David Kennedy of DerbyCon. In case you haven’t been watching CNN, Fox News, or other high-profile media outlets’ reporting on infosec, Dave’s kind of a big deal. His security roots run deep, and I’m super pumped to hear his keynote, “The Changing Tactics of Hackers,” which will talk about how only the first T in TTP tends to change, which can be handy for developing a counter-strategy. Joseph Conway of Crunchy Data: The “Securing PostgreSQL” breakout will look at the newly released PostgreSQL STIG, and promises to be a highly technical look at open source RDBMS security. Jamie Jones of GitHub: The “GitHub + Open Shift = Transparent secure pipeline to production” breakout, which will look at using GitHub Enterprise with Red Hat’s container platform, called OpenShift, to provide a repeatable deployment pipeline. Jamie promises to dig into the APIs supporting this, which sounds really cool. Dan Walsh of Red Hat: Speaking of containers, security rock star Dan Walsh’s breakout, the “Evolution of Containers,” will examine the exciting and fast-paced evolution of the technology, and where the community wants it to end up. Nathaniel McCullum of Red Hat: “Securing Automated Decryption” sounds awesome. As a long-time cypherpunk, I’ve been really excited about Clevis and Tang, which is RHEL’s network bound disk encryption technology. 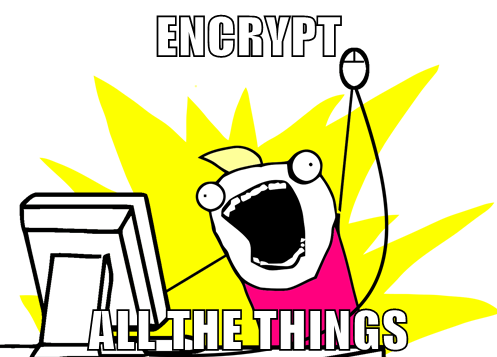 Encrypt all the things! There are still conference passes available, so if you get geeked on open source security, register here.